Just ME: Mama Elephant August Stampede! It's time for the Mama Elephant August Stampede!The new release is live and available for purchase in the store. Just a quick note from me before we get all excited and I forget to say: I'm doing a half-release with Mama Elephant this month, so you will only see my face pop up for half of the stamp highlight days, while our family enjoys a few weeks of sun and sand in Virginia. I used the new set Carnival Cupcakes - it is the cutest thing ever, and designed by one of my favorite illustrators, Torico. I have a few Birdie Brown digital stamps that I purchased through her Etsy store, when that was still in existence. Seriously, she is amazing. I had the pleasure of working with another of her new stamp sets, while I was guesting for MFT this month. I masked the lion to be able to balance him onto the ball, and stuck a cupcake topper flag behind him (but here, it's a circus flag) so he could casually greet you... and he's a party lion, with his birthday hat. just because :) The stripes on the card base were painted on with the chisel tip of a red copic marker. I love that they are imperfect. I hope you like him as much as I do! This stamp set is so versatile, and it goes beyond all the cute things you can do with cupcakes! Oh the lion is soo cute!! This is super duper cute! Love the CAS design and the lion. What? imperfect? I beg to differ, Elena... darling!! We should all strive for such imperfections. I think it's wonderful. I love the little animals in this set. They are really cute. What a super cute card! Love the new release! Ooooo...too cute! I love the new release. WOW!!! this is brilliant card Elena!! What an adorable kid's card! The card made me smile! Very creative. Being a Leo....the lion is adorable to me! Gonna go shopping asap! Matching new stamp set with an existing stamp set works perfectly! Great idea!! Oh my gosh. This card is awesome!! Love the balancing lion and the stripes in the background!!! Too cute. Love this new release. Clever combination of the 2 sets. The lion is adorable! The lion is so cute! Super cute lion! I love the bold striped background!! This little lion is so cute! I love it! So creative! I just love everything about this card: the striped background, the little flag, and that adorable lion sitting on a ball!! Awesome. Oh, this is one adorable card! Just adorable..... love the red/aqua combo! and the lion is great! Super super cute. The lion is one of my favorite critters. And the circus theme is perfect!!! eeeeek! this is circus spectacular! that lion...SOOOO CUTE!! i love the party hat, and the ball, and the striped background! just everything!! this is so sweet - and i swear, it could hang in a nursery flawlessly!! wow!! I just love this circus card... the party hat is so cute. Love the striped background! I love that little lion. Such a pretty card. That lion...balanced on a ball...seriously, it doesn't get much cuter than this! Fabulous! How utterly clever to use that ball from the Nursery set and pair it with the darling lion! Gorgeous card! This is so adorable! I love the little lion on the ball! CUTEST. CARD. EVER. I wanted this stamp set, now I MUST have it! I really like your card such a cute lion! Adorable little lion. He looks lovely against the bold red stripes. Hope you're having a great vacation! Fabulous card! Love this little lion...great for a Leo birthday card. The striped background just is perfect. Very creative placing the little lion on a ball! I like your style! The red makes him POP! Love this card!--so, so cute! And I love those red stripes! Eeek, so cute! I love the sentiment too! Your card is adorable. We just went to the circus last week. Oh, my!...This is 'out of this world, ADORABLE!!! Love it! terrific circus themed card - ME rocks! Such a clever idea to create this circus themed card! Love these cute animals of the Carnival Cupcakes set! This is such a creative way to use those cupcake toppers! I LOVE it!!! So very cute and simple! thanks for sharing! Such a cute card, Elena! I love how you colored the lion, and the striped background is perfect! Your card is adorable. The design and colors make it memorable. like the circus theme that you did for the lion! Darling card! Love the new release! Very sweet card, love it!!! Liked and shared on Facebook!!! Love those stripes and the cute image! Love this card! Sper adorable, love the stripes!!! I follow ME on FB! I like how you made this a circus lion and the striped background. What a cute image!!! Love the design of the card! Oh, this is so sweet, Elena! I love it! Your card is so cute Elena - the baby lion looks gorgeous on the ball! I love these new stamp sets! I love the circus feel of this =) TFS! I love the bold red lines! Those are just so fun and eye catching. Already like and shared on FB!! Already follow and shared on Twitter! Oh my goodness, this is darling! Love that you made more of a boys card! The stripes in the bg are so nice, beautiful card! A great choice of image, given we're in Leo right now. :-) Adorable card! Love this. Like the way you created the background and used all the elements to create the lion. He is cute. Such a sweet card! I love your striped background! Thank you for the inspiration. A darling little lion-beautiful job! Your card is just amazing, Elena. Love the way you have colored that cute party lion and love those background stripes with the red copic marker. Such an amazing idea it is! Beautiful work, as usual. I love the coloring, but I'm totally intrigued by the stripes on the background and the layered look you achieved with them. Your card is just too cute! Love the circus theme. The images are so fun! I love how you put the lion on the circus ball and dressed him for a party! This is such a happy card. I love how you combined the sets. That lion is so cute! I also love the back ground, so circus! That is adorable...love the cute image and how you embellished it with white dots . The striped background is great. I already like ME on FB. I like Mama Elephant on Facebbok! Elena, your circus lion is so cute! I love how you masked and paired it with other images from other sets. The stamps are all so cute! Wonderful card! Mama Elephant has wonderful images. I always leave a little something on the card that is not perfect, so I am loving the red stripes. Not having everything "perfect" helps me enjoy the process rather than sweat out the details. Thank you for sharing! OMG - so darn cute!!!! Thanks for sharing! Oh my cuteness! I love how simple your card is. And the sentiment is adorable! I love a lion! Matching the background to the ball is so smart! I think the background coloured up like a circus tent made the card! Great job! 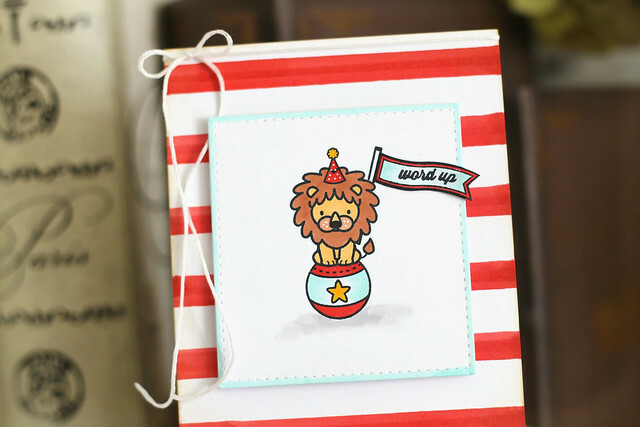 very adorable circus theme card, cute for a baby b-day card! I already follow Mama E on Facebook and left a comment on that page. Great us of the image! The images in this set are good in combining with other stamp sets! i think the card is very adorable. Love the card, so adorable and going to be a fantastic new release!! What a cute card - perfect for our young grandchildren!! ADORABLE! 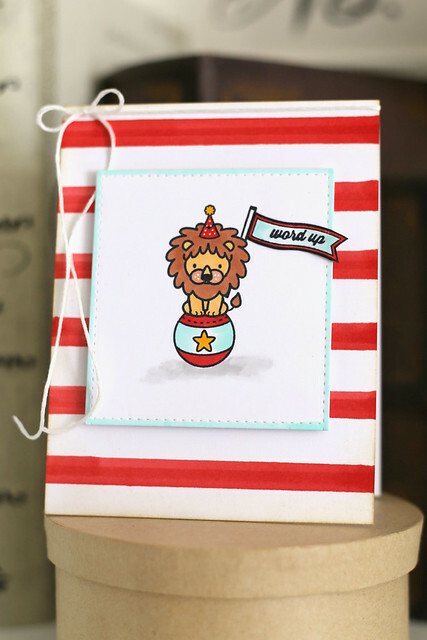 Those stripes are the perfect backdrop for that cute little party lion!!! How SWEET!! I love that little lion. The coloring is superb!! Cute cards. Love the colors. Oh my this is such a cute card! Cute card, love the colors! I really like the way you mixed stamp sets for this one. So cute. So cute! I love the red stripes and the soft blue on the edges of the stitched mat. The sentiment is so fun! Adorable card. These sets are so versatile. Adorable! You're totally blowing me away with all of your projects for this release.